First, I hope you’re feeding free-choice grass hay around the clock. 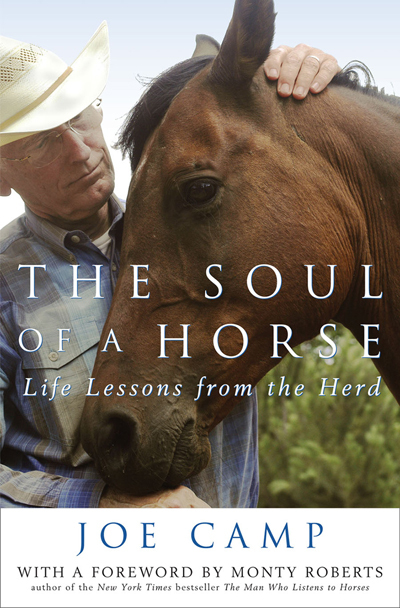 This is a must because, in the wild, horses are moving and eating 12-18 hours a day. Their tiny tummies (comparatively speaking) need to be eating little bits of grass or grass hay pretty much all the time. This is especially important at this time of the year because grass or grass hay is the fuel that powers the horse’s internal heat engine. The only fuel. Nothing else helps the horse generate the heat needed to keep himself warm. If you have any doubts about this, whenever you run into a shivering horse, just give him all the grass hay he can eat and watch the shivering stop. 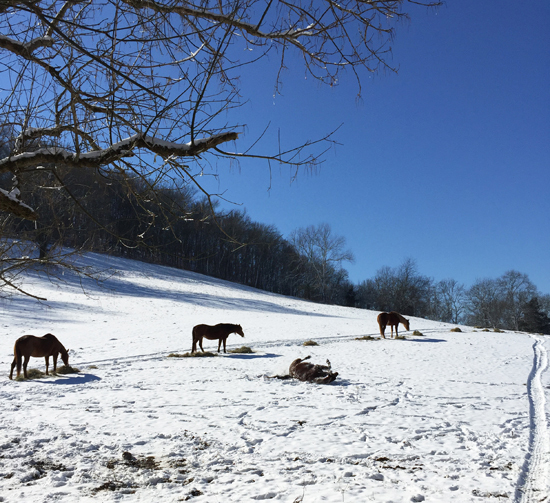 Having a little extra weight, an extra layer of fat if you will, will help going into winter, but let that disappear naturally before spring so that your horses are “lean and mean” and ready to take on the extra sugars occurring in the early spring grasses. As they do in the wild. Horses are genetically programmed to eat grass forage (real grass or grass hay), little bits at a time, up to 18-20 hours a day. And be moving as they eat, thus our hay trail above. Unlike the human’s, the horse’s stomach is programmed to release digestive acid continuously around the clock. When grass forage is not dribbling in on a regular basis the acid has nothing to work on but the insides of the horse itself! The acid is in the stomach, where it can reach the upper squamous region that has no protective mucus lining, which is where most ulcers form. Human digestive acid turns on and off depending upon whether or not food is present. 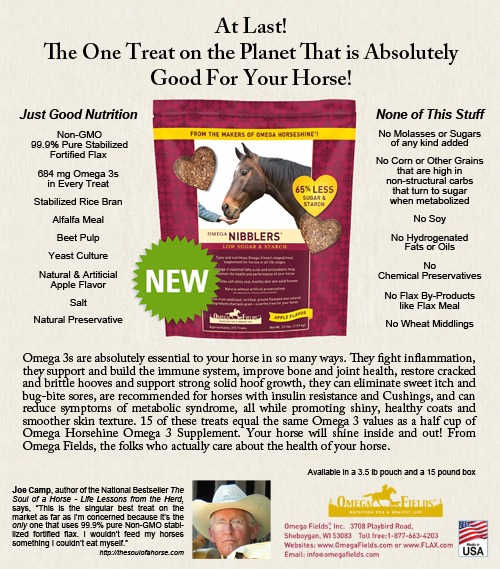 The horse’s digestive acid never stops. So the grass forage needs to be there. Free-choice. Around the clock. Further to this point, Dr. Juliet Getty, Equine Nutritionist, points out, “The cecum in a horse has its entrance and exit at the top. For digested material to exit at the top, it must defy gravity. The organ must be able to contract to push the contents out the top. To do this forage needs to be flowing through the digestive system at all times. 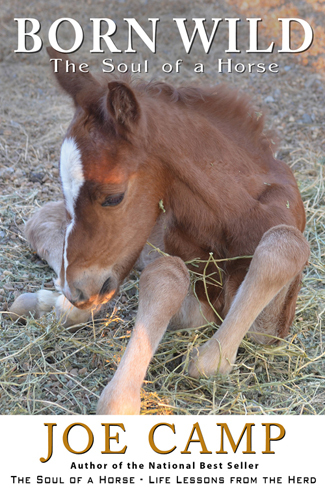 Otherwise, sand, dirt, and undigested material can remain at the bottom of the cecum, leading to colic. To read more on this topic visit:http://thesoulofahorse.com/a-slippery-slope/. This next tip is such a good idea and has worked so beautifully for us since our move to middle Tennessee in 2009 I try to post a reminder every fall. Back in December of 2010, the year after we arrived in middle Tennessee, it was the coldest in recorded history (until last year!) since the early 1940s. We had just limped through eight days of below freezing temperatures. It got so low the first night that the pond totally froze. 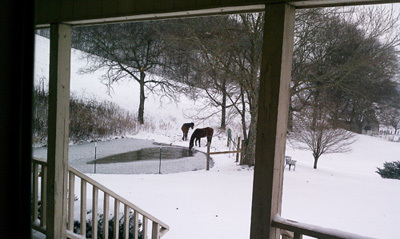 I kept trying to break up the ice along the edges so the horses could get to water (the remnants seen on the gravel in the photo below) but it soon reached the point where it was re-freezing before I could get back into the house. So finally – remembering well Mariah’s fall through the ice the winter before when I had to close off the entire pasture and started filling water tubs down at the barn. But I also remembered the freeze-proof faucet at the barn freezing our first year here, and me hauling jugs of water from the house several times a day, and the gator breaking down so the jugs had to be hauled by hand, and the enormous electric bills caused by the resistance-heating coil in the tub water heater, not to mention how difficult it was to set it all up in such a way that Mouse could neither eat it it or destroy it :). All of that got the ol’ brain working. There must be a way to keep the pond both available and safe. Then I remembered something someone told me in a comment on the blog. They use a submersible pump in their water tubs and it keeps the tubs from freezing. Moving water is much harder to freeze. And the pump uses much less electricity than a tub heater. Hmmm. I wondered if a pump would work in the pond. Especially if I put it very near the edge of the pond where the horses drink. By this time anything was worth a try. It wasn’t even officially winter yet and already we were setting cold temperature records. It could be a long winter. So off to Lowes I went and came home with a $70 submersible pond pump. The kind you might use to make or drive a fountain or a waterfall. I placed it on a concrete block about eight feet from the edge of the pond with the output pointing straight up, covered the power cord with rocks (the ground was already too frozen to dig a trench), ran an extension cord down from the house… and voila, the photo you see below. But would the horses drink? Would the fountain effect scare them? Especially Noelle, the mustang. And Mariah, who had icy memories from the previous year. I decided to leave the pasture closed for the night and see how the little pump fared. It was predicted to drop into the teens. 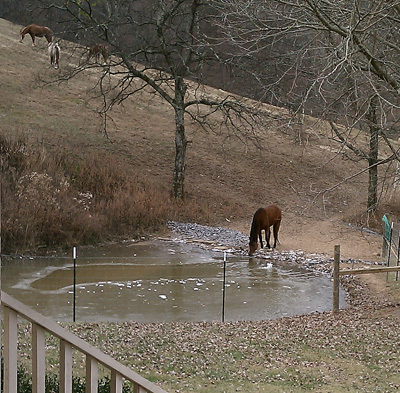 The next morning there was still a beautiful pool in the pond so I opened all the pasture gates during the morning feed. Shortly thereafter I snapped the photo below. Cash was drinking away. Pocket and Skeeter were not far behind him. No one seemed very worried about the bubbling fountain. Pocket studied it but not for long. 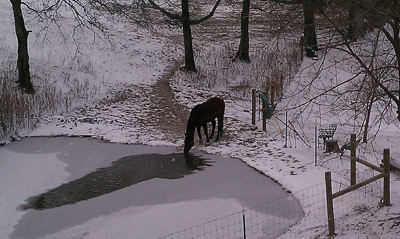 The ice on the gravel and the bubbling water did bother Mariah and she turned away several times before finally drinking. Then came the snow. The next four or five days never got above the mid twenties. The drinking “pool” got smaller but never froze away. I did break up the ice around edge a few times but it was always thin enough for the weight of a horse to easily break it. One night the temperature dropped to 9 degrees. The next morning I was out of bed the minute it was light to check the pond. The photo above was snapped from the upstairs bedroom window. There was a 12″ frozen “shelf ” at the pond’s edge but Cash (who doesn’t like to get his feet wet) would rather reach across than step on the ice. When big ol’ Skeeter came down he just stomped on the shelf and it crumbled. 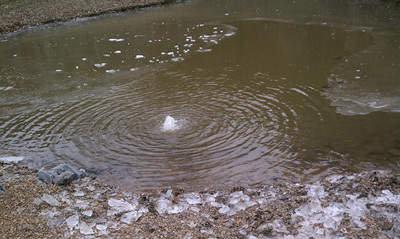 After feeding, I broke up all the ice along the edge of the pond. Conclusions: That great little pump persisted and never once did the horses not have their little pool to drink from. When it got cold enough long enough to cause serious edge freezing I moved the pump closer to the shoreline and that was all it took. I also planned to dig the bottom deeper along the shoreline because one of the reasons it was freezing is that it’s only inches deep right at the edge so the water movement has less effect. If worse had come to worse I might’ve even acquired a second pump. This seems to be a solution that will work for anyone, at least anyone in the mid-latitudes of the U.S. In either a pond or tub. I have no idea what would happen waaay up at the top of the country, or in Canada. Perhaps a bigger, more powerful pump might be needed. If anyone up there tries it I’d love to hear about the results.